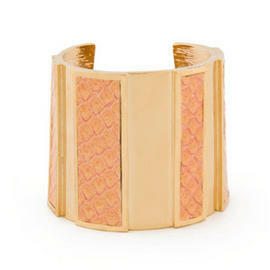 When it comes to accessory designers you should know, Kara Ross is without a doubt on the short list. This 20-year veteran and Georgetown University graduate has been designing jewelry since the age of 13 when a family trip to Africa inspired her to stroll down the path she was born for. 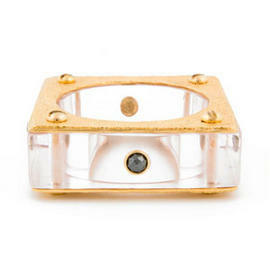 Kara brought home a native gemstone which she later designed into a square cut ring surrounded by diamonds. 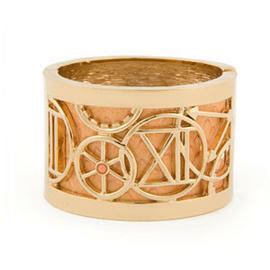 It was that ring that inspired the then teenager to continue to create original pieces. A path that lead to a stint in advertising at Harper’s Bazaar, before creating her own accessory line, Kara Ross New York LLC. All the hard work payed off in 2008 when this ultra talent designer won the FGI Rising Star Accessories Award. These days Kate Hudson, Hilary Swank, Annalynne McCord, and Alessandra Ambrosio are just a few of the Hollywood ladies rocking these beyond uh-mazing pieces. 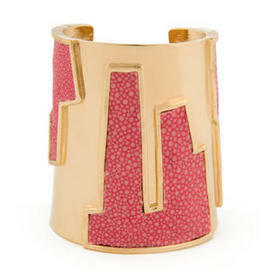 Her 70's inspired cuffs are insanely original. And her use of exotic colors instantly catches your eye. The bright vibrant tropical corals, gleaming blues, deep navy, and browns, set against her shiny, thick gold hardware are truly pieces of art. 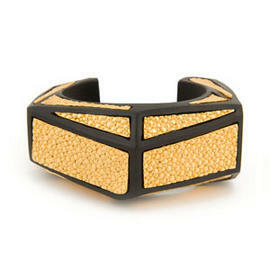 Below are some of my favorite cuffs from Kara's boutique jewelry line. 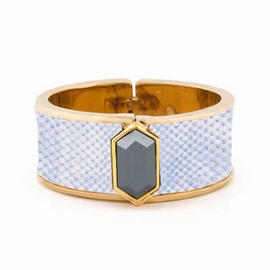 Check out her full collection online at Kararossny.com. 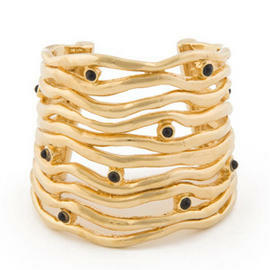 Are you loving her bangles? 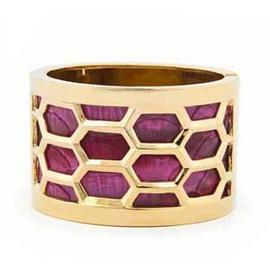 Something Extra: Kara's biggest fan may be none other than first lady Michelle Obama, whose worn over a dozen of Kara's pieces. An obsession that started after Kara was approached by the White House to design an original piece. Kara revealed "The Chief of Protocols' office saw we did wood jewelry, and they wanted to have some things made by an American artist for Michelle Obama to give to visiting heads of state. They sent us this big chunk of wood from the White House lawn. 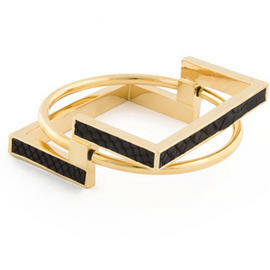 We made some pieces with it and on each one we wrote, 'Designed Exclusively for Michelle Obama by Kara Ross." 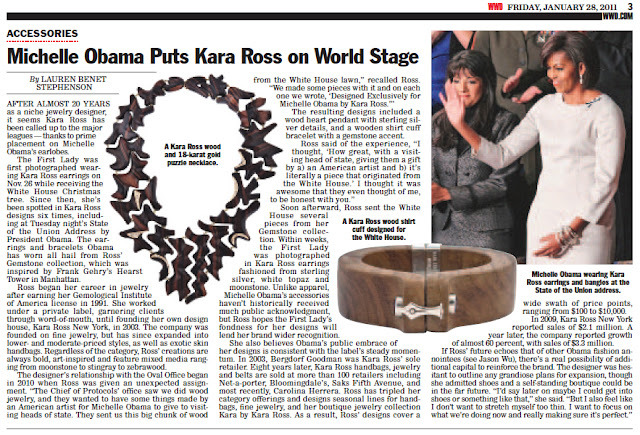 Check out this WWD article to know more about the amazing pieces Kara created. All of these are so beautiful! 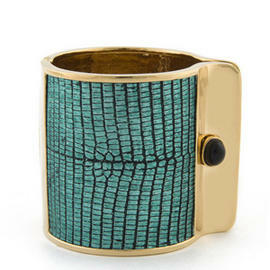 I have a piece by her made of turquoise stingray with a gold clasp, I'm absolutely in love! how lovely and original, love them! oooo I love these so much. Love finding new designers. 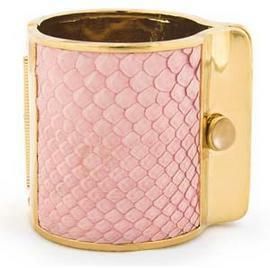 gorgeous, I like cuff s much, from this collection I love this with pink pattern! love all of them so gorgeous! These pieces are so cute! I would definitely buy one! 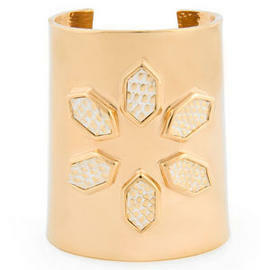 Beautiful cuffs! Thanks for sharing this designer! 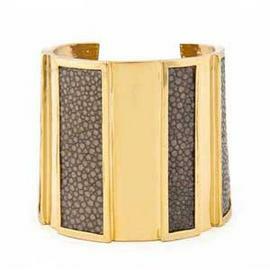 LOVE all these cuffs! Theyr gorgeoussss!